Mini Kinta IRC is fitted with 3 W LEDs to punch through nearly any ambient lighting or fog. Filling a room floor to ceiling with razor sharp beams, it delivers an output that surpasses those of much larger derby effects. 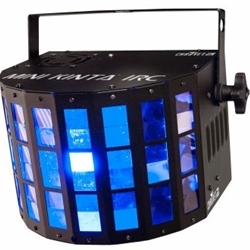 DMX controllable, it also features exciting built-in programs. An optional IRC-6 remote is available for wireless control.